Resch Enterprises Inc | Proven basement waterproofing systems and patented, engineer-certified wall straightening products. Family-owned since 1967. Proven by 50+ years of installations and thousands of satisfied customers. A channel system to drain foundation water - over 100 gallons per minute! Engineer Certified to straighten and stabilize bowing/bulging basement walls. Engineer Certified to straighten basement walls without excavation to the exterior. Resch Enterprises Inc provides contactors with proven basement waterproofing systems and Engineer Certified patented wall straightening products of superior quality. Our products have been tested in the field and perfected with over 50 years of experience. We have been family-owned since 1967. Wet basements can be solved by using the DRY-UP™ Baseboard Waterproofing System to control and channel water from leaking basement walls to a sump pump. The DRY-UP™ Water Tunnel is a channel system specifically designed to help relieve hydro-static pressure around the basement footing. 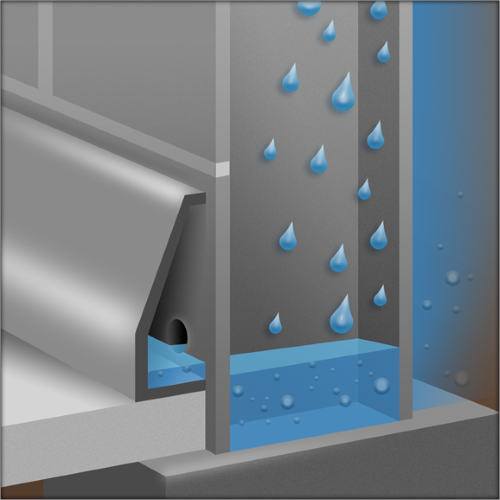 The DRY-UP™ Water Tunnel is the most structurally sound “on top of the footing” drainage system available today. The DRY-UP™ Water Tunnel installed with the DRY-UP™ Dimple Board is the best choice for contractors to use for peace of mind knowing that the basement wall will not shear. If water is coming up through cracks in the inner part of the basement floor, then the DRY-UP™ Geo Channel would need to be installed to relieve the hydrostatic pressure from underneath the floor of the basement. The DRY-UP™ Geo Channel installed with the DRY-UP™ Dimple Board relieves the pressure from underneath the floor of the basement and from the basement walls, solving the water leakage issues. In crawl spaces, humidity is an issue that can negatively affect air quality in the entire house. When the Healthy Home Crawlspace Liner is used with the DRY-UP™ Geo Channel and a Santa Fe Dehumidifier, the customer will have a nice, bright crawlspace with the humidity controlled. Buckling walls can be a very serious problem if left uncorrected. Resch Enterprises Inc has developed and patented two distinct systems which have proven themselves over time and are Engineer Certified! The Hold-Right® Wall Anchor System is a rod and plate Engineer Certified system which pulls the bowing basement wall back into place over time with an earth anchor buried in the ground. Our Engineer Certified Gorilla Wall Braces® work from the interior of the basement, pushing the bulging basement walls back into place over time and stabilizing them. It is the most effective and economical basement wall bracing system on the market today. We also have engineered Carbon Fiber Straps to hold the basement wall with no further movement.